Both “unredeeming and unredeemable,” Tommy Angel is not your typical gospel magician. He is a brutal, narcissistic evangelist. Who is it that has such harsh words for Mr. Angel? None other than his creator, Jonathan Allen.Tommy Angel is a fictional gospel magician, the central figure in a contemporary art project that bears his name. British artist Jonathan Allen inhabits this faux religious performer, bringing him to life primarily for a continuing series of black-and-white photographs. His evocative images create a mood of combative faith, juxtaposing the world of devotional religion with that of performance conjuring. Allen’s own background lies not only in the visual arts, with five years of university study in Fine Art, but in the world of magic as well. Growing up in Surrey, Jonathan first encountered stage magic at the age of seven. “The first trick I ever witnessed,” he recalls, “was the sliding Die Box, performed at my school by none other than the current president of the Magic Circle, Alan Shaxon." The dual interests took hold. Allen performed regularly in his teens, working birthday parties and other informal events. Without the presence of formal magic schools, his higher education became focused largely on “the study of the illusionism of painting.” Since that time, his work as a visual artist has continued to explore the way in which illusion interweaves with everyday life, and shapes contemporary culture in often unexpected ways. Although conceived photographically, Tommy Angel’s first manifestation was in the form of a live performance Allen gave in 2002 as part of A Night of Performance Magic at a small theatre in Sheffield, England. 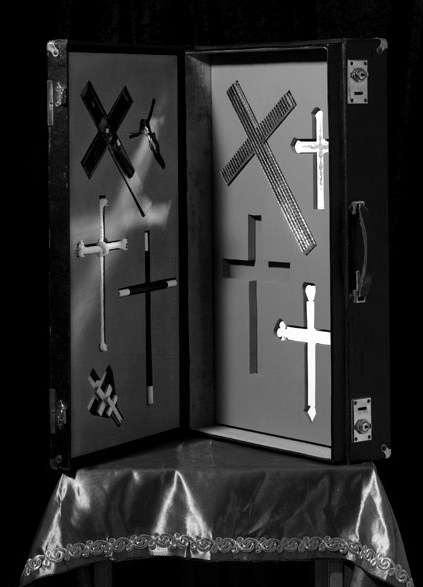 Allen recalls, “This event was mainly directed towards a performance art audience and explored the way in which artists had drawn inspiration from, or referenced the traditions of stage magic.” In that first show, Allen/Angel levitated a cross, presented D’lites as a stigmata routine, and pulled Jesus silks out of a church offering bag. His current ten-minute act opens with him arrogantly striding onstage, pounding a wooden cross into the palm of his hand like a hammer. After levitating it, he points the cross at a female plant in the audience, who is drawn onstage and ‘converted’ into his assistant Miss.Direction. Angel then shoots her with a Bang Gun, which unfurls a banner that reads “Faith.” A remote-controlled statue of Jesus carrying a cross rolls across the stage on a small wheeled platform, a glass floats in the air beneath a bottle pouring communion wine, a bible bursts into flame, and Kevin James’ severed hand illusion is presented as a holy relic. Allen uses the performances as a form of ‘live drawing,' helping him to compose the still photographs in the same way a painter might make studies before committing paint to canvas. “On stage, I sometimes discover new choreographic gestures and imagery which I then selectively recreate before the camera,” he says. Allen works closely with another British photographer Mark Enstone to complete the life-sized photographic tableaux he exhibits in galleries. There are routines depicted in the photographs that are not necessarily portrayed live onstage by Angel. Allen wants his viewers to pick up on “the associations between the rich iconography of both magic and Christian history.” To that end, his photos have reinterpreted a dove act “in a way that reminds the viewer of the many scenes of Christ’s baptism in Renaissance paintings, when the holy spirit descended in the form of a white dove.” The traditional black-and-white magician’s wand has become a cross, just one of many in a suitcase full of such items, including a rope-cross, a diminishing cross, and a cross with playing card pips at its ends. The ‘Pharos’ black art self-decapitation recollects the beheading of John the Baptist, and a paper-tearing routine — which in others’ hands would read the word “Hello” — instead reads “Hell” for Angel. Allen feels he was probably drawn to the theme of religious belief due to its strong presence in his childhood. “One of the first details of magic history that struck me was the theory, often quoted by historians, that the term ‘hocus pocus’ was derived from a lay mishearing of the Catholic priests words as he transubstantiates the host, saying in Latin ‘hoc est corpus’ (‘this is His body’). Whether true or not, the seeds of the idea that conjuring and religious belief were somehow connected were planted. You can feel the link by looking at the word 'conjure' itself, the root of which is in the Latin verb conjurare, meaning 'to swear together', or 'to form a conspiracy. I delighted in stories of Catholic monks using wires and ‘engines’ to make statues blink and cry, in the same way that priests had used stage illusion technology to impress upon believers in earlier times. Allen was one of the moving spirits behind a major art exhibition held at the Site Gallery in Sheffield in 2002, entitled ‘Con Art’. He describes the show as “an exploration of the way in which magicians and visual artists ‘share an imagination’…we wanted to find out what both communities could learn from one another, both historically and in terms of contemporary practice.” The show came about after Jonathan happened to sit next to Amercian art curator Helen Varola at Monday Night Magic in New York in 1998. Jackie Flosso had encouraged Allen to attend after Allen photographed him in his Manhattan shop the day before. Featuring the work of other artists as well as Allen’s own, essays in the catalogue for “Con Art” were written by, among others, Eddie Dawes and Jeff Sheridan. The Tommy Angel photographs recently gained media attention while on display as part of the contemporary art exhibition “Variety” at the De La Warr Pavilion in the UK last year. Tommy/Jonathan will be seen in more exhibitions in London this month, as well as featuring in the first international Singapore Contemporary Art Biennale this fall. Allen has remained involved in the magic world outside of his Angelic endeavors. A chance meeting with illusion designer Paul Kieve more than six years ago has resulted in several collaborations. In 2004 they worked together on Carnesky’s GhostTrain, including a version of Pepper’s Ghost which allowed a performer to dance live with dozens of white doves. The previous year, Allen assisted Kieve with his work for the film Harry Potter and the Prisoner of Azkaban. Other collaborators include British magician Scott Penrose, with whom Allen performed onstage at the Magic Circle, as the head in Penrose’s recreation of the Joseph Hartz presentation of The Sphinx. In 2005, he assisted Penrose again for Dirty Tricks, “a scurrilous television series recently screened on Britain’s Channel4 television.” As consultants, both Kieve and Penrose have contributed to Tommy Angel’s arsenal of evangelical weaponary. The artist is committed to increasing magic’s “suggestiveness,” and to exploring how magic as an art form “ought perhaps recognize that it is profoundly resonant in a culture that is being increasing shaped by illusions and fictions of many kinds. Jonathan Allen’s Tommy Angel photographs will be showing at David Risley Gallery, London Jan12-Feb19. Tommy Angel will perform at Tate Britain on February 3rd. Jonathan’s work will be featured at the first Singapore Contemporary Art Biennale, an international exhibition with the theme of “Belief,” running from September 4 through November 12, 2006."